A brief guide to Dnepr (aka Dnieper) 650cc ohv motorbikes. 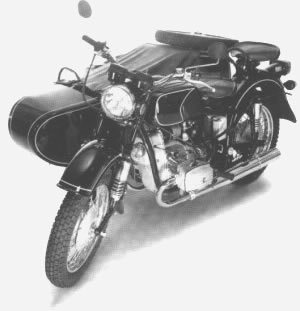 This site is not intended to give a detailed history of Russian motorcycles, but should, with luck, allow you to easily identify the various models. Dnepr bikes are NOT built in Russia and never have been. Sadly they are no longer in production. The Dnepr (or dnieper if you like) motorcycle and how to identify it. 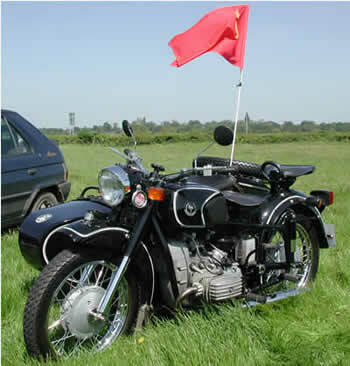 Classic shot of a Dnepr MT11, sold in the UK under various names including Cossack in the 1970's and Neval in the 1980's and 90's. Dnepr MT9, simply the best of the OHV Dneprs made. The MT9 has a wonderfully smooth and well balanced motor. The later MT11 have a reputation for snapping their cranks, the MT9 does not. You do have to put up with 6 volt electrics on the earlier MT9, and even single leading shoe front brakes (the MT11 twin leading shoe fits straight on). The general look of the engine is squarer than the Ural. The rocker cover to the left shows the almost rectangle shape with five evenly spaced raised lines. There where a few made with no lines, but the shape didn't change. 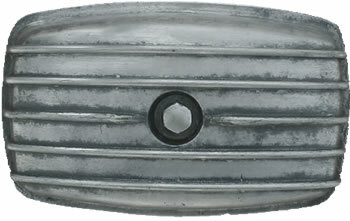 The timing cover (shown on the right) at the front of the engine is also angular, this one has the most common Dnepr logo as part of the casting. The other logo looks like a pile of triangles making one larger triangle. Picture on the left shows the famously awful K301 carburetor, These are standard fitment on MT9 and MT 10-36 Dneprs. If you have them and they work you are one of the few lucky people. The main problems seems to be in a surprising short time, they are worn out. One solution is a replacement pair of reconditioned K301s. The other slightly better solution is to fit just about any other carb. Pictured on the right is the K63/K65. These are ok if you don't mind setting and adjusting carburetors every other week. The K65 will not fit straight on a bike which originally had K301 carbs. Dnepr 6 or 12 volt ?, how to tell the difference. 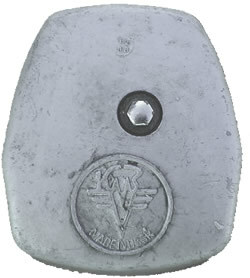 The 6 volt dynamo above is fitted as standard to the Dnepr MT9 before about 1979. It is quiet, reasonably reliable, and doesn't over stress the cam gear that drives it. 6 volt lights are a little hopeless, and the indicators will almost stop when the bike is at tick over. 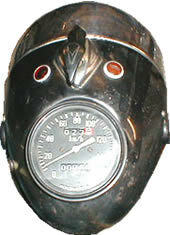 It is held on to the engine with a metal strap round the middle and often leaks oil between the engine and the dynamo. There have been numerous attempts over the years to build 12 volt conversion regulators for these. Nearly all work for a short time, and nearly all burn the dynamo out after a few thousand miles. The Dnepr MT10-36 and MT11 both use the L424 150 watt alternator with separate external regulator. It is impossible to say if these are good or bad. They work well enough and produce enough power for decent 12 volt lights. But some last for ever, and a few fail after only a few thousand miles. There seems to be no way of predicting which will last and which will fail. If you have one and it works, don't fit loads of electrical extras to your bike just in case. Frame and body work. Although Dneprs and Urals are often confused, they are very different bikes in almost every detail. 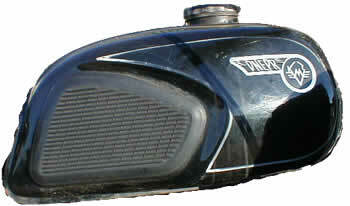 All Dnepr Motorcycles from the MT9 to the MT11 have the tank you see in the picture above. There are a few very early MT9 bikes about with the earlier tank from the side valve K750, but generally this tank is what you get. 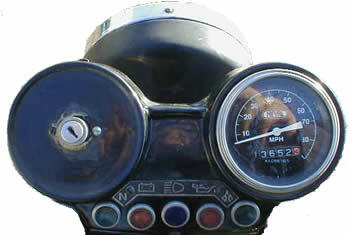 Late Dnepr dash boards are above the head light with a row of five warning lights. 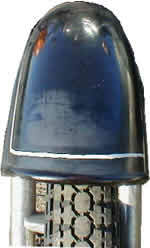 This is the MT11 model. Neval liked to play around with the basic MT11 to produce various models so you may find the key switch moved to the centre anda rev counter to one side in it's place. Dnepr MT9 and early MT10-36 models have the same dash as early Urals with the speedo sunk right into the headlight. 99% of Dnepr bikes have these large rounded mudguards both front and back, They are a one piece pressing so have no seams on the sides.